Slax project is pleased to announce the eighth update of its stable distribution, based on Debian stretch. This point release only updates some of the packages included, no new features were added. EDIT: I completely forgot that one feature was indeed added to this release, the possibility to exclude core Slax modules when rebuilding new ISO with genslaxiso command. Most importantly, this version adds long-requested feature - udev rules to automount plugged-in disk drives, so they appear in pcmanfm file manager without the need to mount them manually. Furthermore, all packages were updated to their newest versions, and few small bugs were fixed. While I was repackaging ISO for 64bit version of Slax 9.6.1, I used midnight commander to extract the iso contents. Unfortunately I forgot that there is a bug in midnight commander and it does not see empty directories. For that reason, Slax 9.6.2 ISO file did not contain /slax/changes directory, which is needed for storing persistent changes. You can fix that yourself easily by simply creating that directory. I've already pushed out version 9.6.3, which fixes this. You may notice that 32bit version 9.6.1 is the same as 9.6.2 and also the same as 9.6.3. Only 64bit version was affected and changed during these version bumps. Maybe you noticed two version bumps yesterday, so I'd like to explain the reason behind them. Slax 9.6.0 had two problems introduced in that version. Firstly, the advertised pxe script had a flaw, causing it to generate unbootable initramfs image. I am not sure how this happened since it was thoroughly tested before the release, perhaps it was not thorough enough :] Secondly, the newly installed dnsmasq daemon, which should be started only by the pxe script, was autostarted by systemd on every boot, even for users who never need pxe at all, that was not intentional. So I've fixed those two issues by releasing Slax version 9.6.1. Unfortunately, while releasing that fix in a hurry, I forgot my custom build-module in 64bit version of 9.6.1, which made the ISO unusable. I am using this build-module to automate building of Slax, but it must never be included in the released ISO file. To fix that mistake, I've repackaged the 64bit ISO image and released it as Slax version 9.6.2. I am happy to announce that a next version of Slax Linux has been released. Slax is a minimalistic, fully modular operating system. As usual, this version incorporates all upstream improvements from Debian stable, and fixes few small known bugs. You can download or purchase Slax from the project's home page. After a short testing with no problems reported, I feel it is now the right time to release next version of Slax Linux - a minimalistic, fully modular operating system. This version incorporates all upstream improvements from Debian stable, adds several default applications and fixes several known bugs. File manager now understands file types, so it is easier for users to open files like images, pdf documents, and so on. On top of all that, Slax now includes one-click-to-install launchers, to offer additional software to users while keeping Slax size small. If the current approach proves useful, Slax could contain lots of icons for additional programs, which will be simply installed (automatically) when launched for the first time. You can download Slax from the project's home page. Most of you celebrate something today, so here is a little gift for you :) I've released Slax 9.3 just few minutes ago and I have to say that I am happy with the progress we are making. I spent some time testing Slax to boot from many different filesystems and I was able to identify some problems, which are now fixed. Most importantly this includes NTFS and ext4 support, so Slax is now capable of booting from them as well. If you boot from a writable media, the Persistent Changes feature is enabled by default now. Note that you may need to erase your changes.dat file if it was created by beta/beta2. There is nothing new, just few bugs fixed to make things actually work as advertised. Please read changelog on previous beta release for more. I noticed that Debian has updated to 9.3.0 so it's time to update Slax too. I plan to release update with each minor Debian release, if there are any bugfixes or changes (in Slax) at that moment. I will update this blog post as I progress through my todo list. 4) copy the vesamenu.c32 to your USB disk with Slax and try to boot Slax again. If this helps to resolve your problem, please reply here that vesamenu.c32 is the only file which needs update. However, it is possible that some more files need to be added, so if only vesamenu.c32 won't help to fix your problem, try to copy also ./bios/com32/libutil/libutil.c32, ./bios/com32/libcom/libcom.c32, and maybe some others from the ./bios/com32 directory. I don't think that those are needed, but you can test. I cannot solve this alone, since it doesn't fail on my computer. Thank you very much for your time playing with this. In a reply to several questions about persistence, I'd like to put here few hints. Remember that this all works after reboot only if you select "Keep changes persistent" in the boot menu, and only if you are running Slax from a writable media such as USB disk. 1) how to make sshd server start automatically? You can start ssh server manually by running service ssh start. If you run it the first time, it creates some keys in /etc/ssh/ directory, so the first start is a little bit longer. But even after the keys are created, sshd won't autostart on reboot. It's because I manually disabled it in Slax, because root's password is well known. So, make sure to change your root's password (and password of the guest user) to something new. When done, run systemctl enable ssh. It will basically create a symlink to ssh.service in multi-user.target.wants (which is in /etc/systemd/system directory). This ensures sshd will be started on boot. 2) How to make keyboard layout persistent? I forgot to implement such functionality. So keyboard layout needs to be set from the fluxbox menu each time and there is no config file to change. You can make it persistent by editing /root/.fluxbox/startup ... add there a line such as setxkbmap fr for french keyboard layout, etc. Make sure it is somewhere on top of the file. I will probably fix the persistence of keyboard layout in next Slax release, so if you set it this way, you may need to remove it from the startup file again at some point later, when Slax fixes this. 3) how to disable autostart of Xorg? Similarly like enabling ssh server, you may disable autostarting of X by the following command: systemctl disable xorg. This will remove display-manager.service symlink from /etc/systemd/system and you will get only text-mode console on next boot. You can still start X manually with the startx command after login, though. This will put an icon in system tray, which you can use to access network settings using GUI. After several years of inactivity Slax project has been brought to life again in new version 9.2.1. For those who did not hear about it yet, Slax is a little distribution of GNU/Linux (in 200 MB), which runs on your computer without installing, and makes no changes to it (unless you tell it to do so). This time, Slax uses Debian stretch as its base, and thus it can offer all the wonders of the mighty 'apt' command. If you are missing any software in Slax, use 'apt install SOFTWARENAME' to get it in an instant. I've decided to go for Debian because it made my life much easier and I believe that it will make yours too. Graphical desktop uses FluxBox window manager and xLunch, which was written especially for Slax and with Slax needs in mind. Furthermore the development of xLunch continues independently. 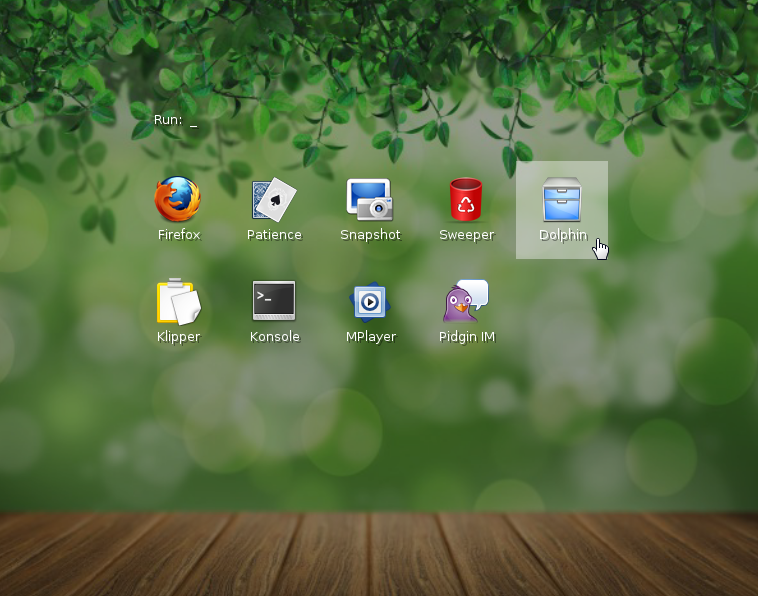 You can consider Slax as a simple and minimalistic base Linux system, which you can carry in your pocket. FluxBox is somehow limited in the way how to customize its look. No icons on desktop, no shutdown buttons... So I hired a programmer who wrote the best application on the world - SysTray Icon Launcher. It is like 50 lines of code, and what it does is pretty simple. Put an icon to system tray and execute a command when it is clicked. Thanks to it, we now have an awesome power button in about 20KB or so :) Hell I love this wallpaper, all screenshots are so cool! I am finishing last few bits of the next gen Slax release. I think the biggest difference for the end user will be lack of applications. People were probably used to a rich collection of apps in Slax, including GUI file manager, video player, instant messaging program, card games, remote desktop app, more card games, ... :-) None of this will be included in the next Slax release. I may prepare, in the future, a bigger and more feature rich version, but for now, i am sticking with the only necessary software: xterm and web browser (chromium). There is also leafpad as text editor and qalculate as a calculator, those apps were like 200KB in total, so I added them. But other than that, only browser and terminal. I believe that everything (and I mean really EVERYTHING) is moving to the web. In most cases, web browser is the only software you need nowadays for various tasks. Spreadsheeds? online. Video player? Online. And thanks to apt-get (now included in Slax), most of the available software is online as well. So for now, four icons will be fully sufficient. Here are some first Slax screenshots. The wallpaper was created specially for Slax. If you were used to access files in /mnt/live/* in Slax, then you will have to change your habits (and scripts) because that is now available in a different path: /run/initramfs/* ... Explanation why this change was necessary follows. When Slax was based on Slackware, I had to manually patch the rc scripts for shutdown, to return control back to initramfs which could safely unmount all devices and reboot. But after changing to Debian base, there are no such rc scripts (due to systemd). Systemd has some hardcoded logic on what it tries to unmount. I had to digg into systemd source codes to find out what it actually does during reboot, and I was happy to find a solution. Previous Slax puts the initramfs-root-filesystem in /mnt/live/ by calling pivot_root. But systemd has no idea this directory is special, and it tries to unmount it (including all submounts) on shutdown, making Debian report lots of red warnings. As it shows up, there is no possibility to exclude certain mountpoints from unmounting when the system is ending, however systemd has several exclude-paths hardcoded. It is / (root directory, obviously), /run/initramfs and /usr. So, instead of pivoting the root to /mnt/live, I had to modify linux-live-kit to pivot into /run/initramfs, in order for all systemd-based distros to ignore unmounting of initrd-based mounts, resulting in shutdown without errors. In order to unmount those properly, systemd executes /run/initramfs/shutdown. One problem appeared immediately - Debian overmounts /run on boot with tmpfs, which made the /run/initramfs inaccessible (even mount --bind /run /somewhere couldn't help). So I had to make a little change in the initial startup - mount the 'run/' directory first with tmpfs, then create run/initramfs/, and then pivot root. Debian recognizes that /run is areadly mounted and doesn't overmount it again, leaving /run/initramfs accessible. Bingo. During the past days I've received lots of feedback for the upcoming release of Slax, by email, blog, and other channels. Some of the users welcome Debian, some of them hate it, some don't care :) I think I've explained my reasons why I choosed Debian in my previous post, so I won't repeat that here. But some users are concerned about systemd and would like to know my views of it. So I'd like to mention few things here. To understand it better, we need to look at how your computer starts. When your computer is turned on, it checks bootable disks or CDs and loads a 'bootloader' first. This is a little software, which is located on your hard drive's first sector, and once executed, its only purpose is to find Linux kernel, load it to memory and execute it (plus pass some parameters to it). Linux kernel is much bigger binary, it is the core of evey Linux system. After Linux kernel is loaded and executed, it takes over your computer, and provides functions for all of your software to interact with your computer's hardware. Once the kernel initializes everything and is ready to manage everything, it calls the init. In Slax, things are more complicated due to another added layer, but lets ignore this now. So kernel finds the 'init' file on your disk, usually in /sbin/init, and executes it. So, init is the first process which gets always executed, and which takes care of the rest of the boot procedure. This init may have different forms. It may be a simple statically compiled program, which does not require any other libraries, and which goes through /etc/rc.d/ directory and runs all scripts stored there sequentially, to perform some initial tasks (like mounting partitions, starting daemons, etc.) before you get your login prompt. The init may be also a more complicated program, which does something more advanced. Or, the init can do a hell a lot of complicated stuff, as like in the case of systemd, in order to provide some "advanced functionality", before the login prompt is displayed to the user. Systemd is not a single binary to execute, it depends on functionality provided by additional libraries such as dbus, pam, notify, and lots of others. From my point of view in Slax, I don't really need to know what kind of init is used at all. Slax adds a layer in between the kernel and the distribution (be it Debian or Slackware or anything else) to provide a way to run Linux from a read-only media as like as it was writable. After this layer is set up, then the init of the underlaying distro is executed and continues normally, and it doesn't matter for Slax what the init is or does. To sum it up, I don't really care if the init is systemd or something else. It does not affect me at all. I am not sure what is the most important concern of some users who do not like systemd. I believe that there are two factors. First may be the complexity of systemd, which surely makes it hard to maintain its code, and goes against the phylosophy of Linux in general (kiss = keep it simple, stupid). By the way, is this really the phylosophy of Linux? :) Anyway, the other factor may be that the adoption of systemd seemed like it was forced to the end users, because once your distro uses systemd, lots of things start depending on it and there is really big problem for package maintainers, they would have to release many packages twice - once for systemd-enabled systems, and once for non-systemd ones, so it is easier for them to stick just with systemd and ignore the rest, which leaves no possibility for the end users to switch to different init they like. If you have faced any issues as the end user, I welcome your comments. Thank you! The main decision I had to make is to abandon Slackware. Yes it's true, next Slax is not going to be based on Slackware. Sorry Slack fans. The reason is simple: lazyness. I am too lazy, reall, really lazy. When I prepared Slax from Slackware, I had to patch kernel with aufs, configure, recompile, etc. etc. Then compile other software from sources, fight dependencies, and so on. I enjoyed doing that in the past, but now I'm not in the mood anymore. So, I've selected a different base for Slax. And it is, prepare youself, hold on, hold on, ... Debian. I had to learn few new things with Debian, but other than that, it is the same as Slackware. I mean, all Linux distros are the same anyway, ... it's all Linux. Debian has the advantage of 'apt-get install aufs-dkms'. This simple command helps me add aufs to the kernel in an instant, and it's the main reason why I selected Debian. Another good reason is the database of packages for Debian, there is hell a lot of them. So what is it going to look like? When is it going to be released? Well, I have it almost ready! :) I'm going to use fluxbox for window manager, compton for compositing (fading effects, transparency), xlunch as app launcher, xterm for terminal and chromium as web browser. That's it. All of this in a 800 KB download ISO image. Yes, you read it right, 800 KB, that's true, I'm not kidding :-) Standard ISO size is going to be like 210 MB, but there will be also a ~800 KB version which will simply boot everything over network. It will mount the big iso from web and download only the parts which are actually accessed. It can also work peer to peer, so all slax users who boot from network may connect to others to get Slax data (verified by checksum using official server). If I am in the mood, I will maybe prepare a 1 GB version with some software collection. But at the moment I don't feel that's necessary, you can simply add anything you want using 'apt-get install' (and make a permanent module using 'savechanges' script), and there is no need for many software applications nowadays, since everything is moving to the web. You'll probably want to see some amazing screenshots. Well, can't show you any yet, since I don't have the most important part for Slax - the right wallpaper ;-) As soon as I select one, I'll show you. Next Slax should be available in about a week or two. More news to come ... :) Stay tuned, and take care. I've developed my first program for X. It's called xlunch, and it's a Graphical app launcher, using pure Xlib and Imlib2. It allows you to run a program by clicking its icon. Alternatively you can just type any command using your keyboard. UTF8 is supported. The Run commandline also works as a filter for the icons, as long as the title or command matches, icon is visible. I will be happy if you try it and possibly let me know what you think about it, bug fixes or patches in general are very welcome. I have already few ideas how to improve it, which I have covered in github's issues. Feel free to submit your own issue, feature request, or comment.